Jains believe that karma decides which way the soul will go in the next life, and that the soul and the body are two separate entities. It is thought that the greatest thing one can do in this life is making the gift of life to help another person live a better life. "It is very nobel to donate the organs of your body. It helps the survival of another human who will cherish his or her life." "For Jains after death the soul departs, and the body is no use to anyone and therefore donating organs of your body to other human life will mean doing a great deed on your part." "The Jain faith is centred around the belief in 'Ahimsa', which translates into a non-violent, compassionate attitude to all life. "We firmly believe in reincarnation, and that the soul with us migrates to another body upon death. 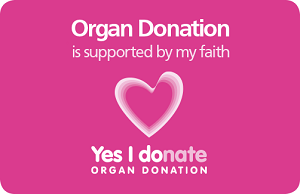 "As Jains, we believe that if through organ donation we can give others a better, more meaningful life, especially after our death, then we should both wholeheartedly embrace this and also encourage others to do it." If you support organ donation, why not download our Jain digital, printable and smartphone wallpaper donor cards?